The future of business comes down to shared experiences. And it is these shared experiences that can often trump your product or service. 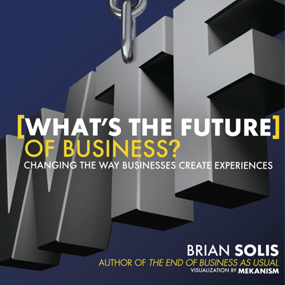 In his new book, best-selling author Brian Solis explores the importance of experiential design and how to navigate the evolving landscape of new consumerism. What’s the Future of Business focuses on four distinct moments of truth and examines how customer behavior unfolds and flourishes in the new world. The book is an experience in of itself. It’s a visually rich, square-shaped four-color journey…think digital app but in an analog format. To bring the experience to life, Brian reached out to his friends at Mekanism, a well-known creative agency in SF and NY. Additionally, acclaimed artist (and also a good friend) Hugh Macleod (@gapingvoid) joined the team to add a witty and personalized touch through original artwork in each chapter.